The kicking off of GoodCall feels like yesterday for me but it has been already more than 5 years since we started. Since then we’ve hired and “raised” a lot of recruitment professionals who continue their career with us or, in some cases, on the customer side. We’ve also trained thousands of HR professionals in our Recruitment Academy and we’ve helped shape the the market with our recruitment software solution, Datacruit. 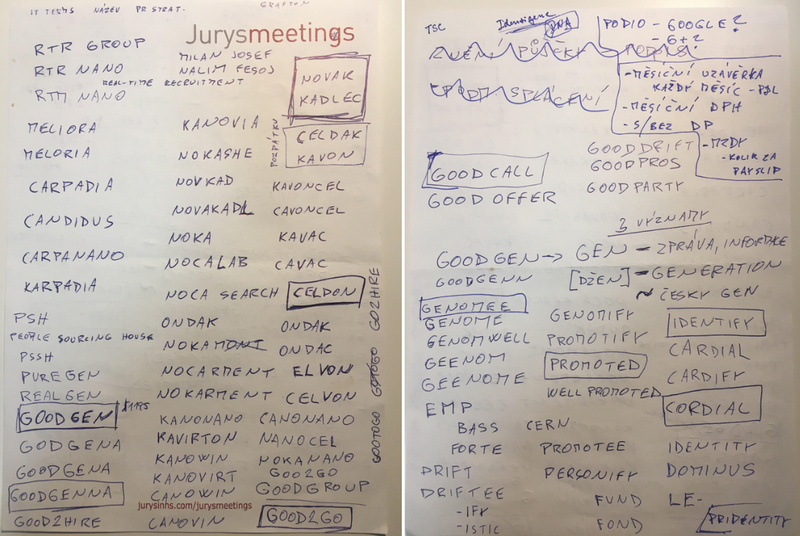 As you can see, due to the complexity of our brands, the history of our GoodCall Group might be quite difficult to understand. When our newcomers already started to ask me questions like “when, what, where, how, why,…” about GoodCall history, I decided to write this brief article series covering our beginnings, business context, myths and where we have evolved over the years into a 140+ employee beast reaching 100+ mil czk in annual revenues and spreading across 3 countries and 7 branches. Cherchez la femme. There is a woman at every case. And there was one who planted the seed of GoodCall as well. Wait for it. As a former software engineer who went head-over-heels into the talent sourcing and recruitment industry utilizing my cross-field experience, I was in the 9-month process of publishing the book People as Merchandise (free download). I was using the self-publishing platform Createspace by Amazon – a so-called publishing on-demand. How it works in a nutshell is that you prepare the book (a cover and the body of the book as a separate PDF), upload it to Createspace, set the price and other details and they send you a test version paperback of your book. This test book looks like the final book, except there is a watermark on the last page. Once you are satisfied with the output, you give your approval via the Createspace website and the book is will soon appear on Amazon.com (.de, .co.uk, etc.) and other affiliated media and branches. There are no books printed in advance. A customer purchases the book on Amazon.com, the book is printed and sent to the customer. You, as an author, get a royalty. At that time in 2013 shortly prior to the official publishing of my book, I took this test copy and visited a Texas Hold’em Poker tournament organized by the community of mostly online entrepreneurs, IT fellas and some other people around me and my friends. Three full poker tables, paid croupiers on a rooftop of a Prague mansion. Lukas Stibor showing us the mobile app Spendee before it was even published. Spendee is now the top financial app in the USA (more than 1 mil downloads in 2015 and the first fintech company having a license by Czech National Bank). Pavel Matousek, founder of AAApoptavka.cz and investor in other online projects. Ivan Matosyan, founder of megaobchod.cz, vime.cz and videolektor.cz. Jan Barta, one of the largest global internet domain traders, founder of the leadgen business Elephant Orchestra and significant shareholder in ePojisteni.cz to name a few. Oleg Veselkov, the king of crypto currencies. And many others, but here comes the key moment: After the three tables consolidated into two, I was sitting next to a lady who asked me if she can take a look at the book that was put next to me. The lady was Michaela Madova, Recruiter EMEA at Quintiles at that time. What a coincidence. A recruiter at such a poker tournament. She asked if she could take the book, People as Merchandise, and give it to her friend who might be interested in it. Consider that this was six years ago, so the market was very different then. Almost no companies or recruitment agencies had a clue how LinkedIn and social media could be efficiently used for recruitment, but they were curious about it. Thus, I was invited to literally all Czech HR conferences in 2013/2014 as a complete stranger in the recruitment industry! Michaela Madova gave the book to her colleague from a company where she worked before. The company was Grafton Recruitment. And the colleague she gave it to was Milan Novak, CEO at Grafton Europe. A brilliant mind in recruitment who developed himself from a junior IT recruiter up to the highest position in a company which was the number one in the perm recruitment business in the region. He had the highest business acumen and leadership skills that I had ever been around. 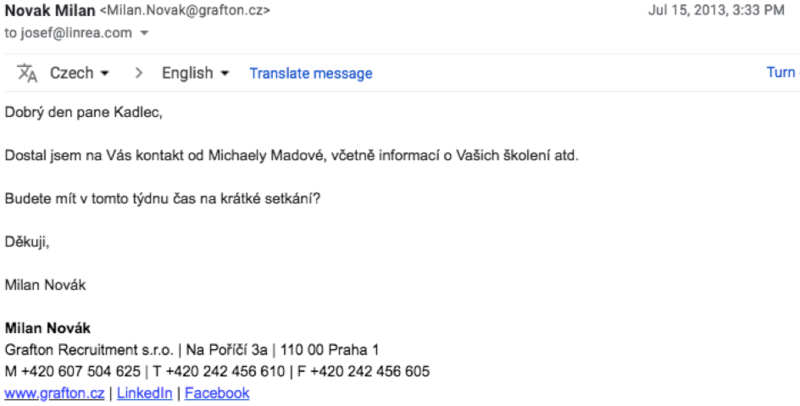 I’ve received your contact details by Michaela Madova including the information about your training, etc. Would you have time for a short meeting this week? This is the original message in the Czech language. Thank you for your interest. I’m available till Thursday any time. We can meet already tomorrow (Tuesday). When would you have time? Within a few short months we agreed on setting up a new company based on the new recruitment concepts such as talent sourcing, marketing, technology, transparency, market education, etc. Milan left Grafton and I transferred all my recruitment activities and clients into the new venture. There was one funny parallel for me in this. In 2008 when I was practicing recruitment as a one-man show company utilizing new marketing and technological techniques mostly unknown in other companies, I received an appeal by Grafton’s law firm that I shouldn’t use some PPC recruitment campaigns mentioning their name. When I mentioned that to Milan, who remembered this old case, we had a good laugh about life’s destiny. At the beginning we had no offices so we were meeting at cafés. But as two non-coffee drinkers we were struggling quite a bit sometimes drinking only water and fresh juices :-). The next unexpected challenge was the name of the company. We held several sessions also with our Slovak counterpart. But in the end we weren’t able to come to a consensus with a clear output on a name we all loved. It’s not an easy task and making a decision on the spot is even harder. But we needed the name fast to set up new business entity and hire the first employees. 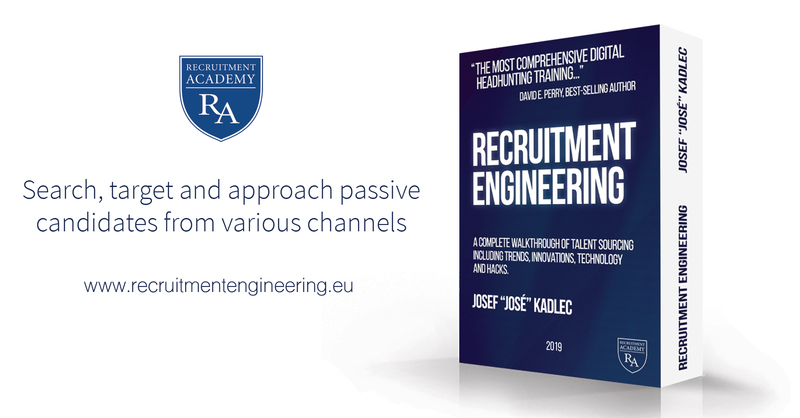 That is why we decided to use my domain name RecruitmentAcademy.cz which I registered when I set up LINREA (LinkedIn Recruitment Academy) after the book was published. So the first employees and customers where hired through the Recruitment Academy brand. We saved some time to properly think of the brand name. 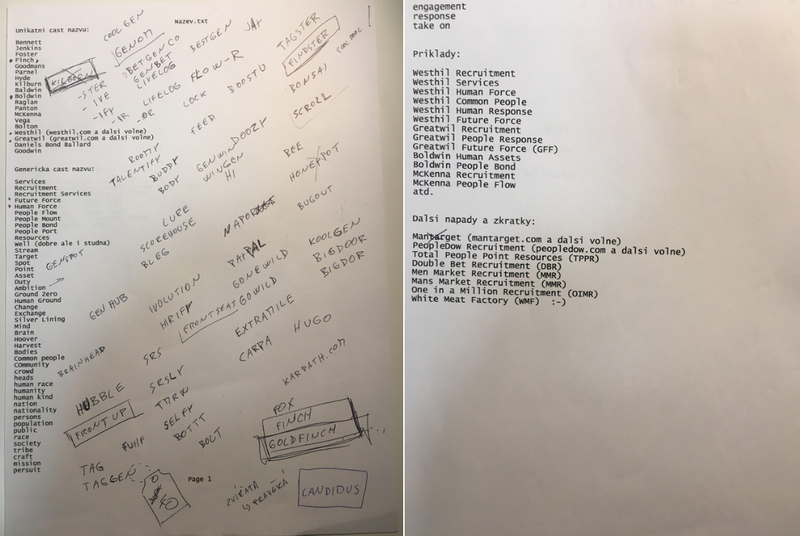 I had already created some brand names in the past (Jobs Consulting, Trump Executives, Linrea) and as the marketing and technical brain in this couple with Milan, I took it seriously and dug deep into it. See my original brainstorming. In the final picture you can see the winning GOODCALL name. So my final suggestion was to name the company GoodCall. This proposal finally succeeded among my other peers as well. And since this time I had to come up with some other brand names (Datacruit, Binary, etc.) and it seems I found an almost mathematical formula for a successful brand name creation (I’ll cover that topic in a future article. So Recruitment Academy was actually born a few months prior to GoodCall. In the winter of 2013 we held the first assessment center where we selected the very first aspirants for the new role of Talent Sourcer. We still didn’t have any offices at that time so we arranged the first AC at Aspen Business Center on V Jámě in the centre. One could say that the GoodCall foundation was built right there. After that we moved into Palace Koruna at Wenceslas Square 1, Prague 1 which is a great address and we’ve been here since then. The first office had 4 rooms. One room for me, Milan Novak, Hana Pelikanova (Recruiter) and Roman Bittner (Software Engineer developing our own ATS that we opened to public after about a year). The second room for the bunch of the very first talent sourcers. The third room for meetings and interviews. And the fourth room was a training room. That was the initial setup. The original strategy was to employ our first talent sourcers under Recruitment Academy and other employees such as recruiters under GoodCall when the business entity was set up in March 2014. After some time we strictly separated the two entities with Recruitment Academy as an educational division and GoodCall as a recruitment firm. After a few months we were joined by our Slovak partners and with them GoodCall and Recruitment Academy were up and running in Slovak Republic as well. These were truly startup times where Milan and I abandoned our lifestyles a little bit and had practically zero salary. We were pushed by the true desire to change the market. And the fact that our experience and knowledge were pretty different but still compatible and focusing on the same industry, drove the rocket start of the company. In the end Pavel Matousek won the tournament. What I won was the very beginning of a new life avenue. In the next article we will talk Goodcall 2019, business context and results and also straighten some myths about GoodCall. Stay tuned, download the book which started the GoodCall legacy and happy hunting! Follow me (LI, TW, FB, IG) for more updates.